Tom Simoneau is back today with Brian Maloney, winemaker at De Loach Vineyards, in to talk with Steve Jaxon and Dan Berger. He is also in charge of the Sonoma County wines of the Boisset collection and he also made a sweepstakes-winning wine for Buena Vista. Brian’s great grandfather planted vineyards and founded a vineyard at the turn of the 20th century. He was born and raised in Sonoma County and his family has farmed for over 100 years. He attended UC Davis and right after worked for Greg La Follette at De Loach, and for Jean-Charles Boisset. He purchased the Buena Vista winery in Sonoma and they are bringing it back to life. They replanted some vineyards and these wines are the result. Brian tells about Jean-Charles, who studied at USF and UCLA and is married to Gina Gallo. Dan Berger tells that the Boisset wine empire is one of the most revered in Europe, with great winemaking teams all over Burgundy. They already knew an awful lot about wine when he came to California. He speaks glowingly of California wine. Tom says he takes a lot of heat in France for that. Dan says he’s really quite a spokesman for California wine. Brian says he inspires you to make a better wine and it’s what they’re doing in the vineyards and in the wineries. 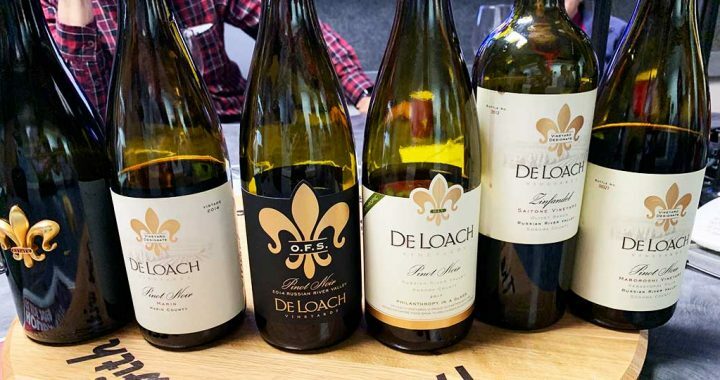 De Loach, founded by Cecil De Loach who was a fireman, made great wine and then sold the winery and started Hook & Ladder. They’ve been on this show too, last Aug. 15. It’s a cooler area of the Russian River Valley in his area that they call Olivette. Dan says the most consistent Zinfandels come from there, old vines still producing good tonnages and great wine. The Chardonnay vines are right in front of their tasting room. They taste a 2016 De Loach Chardonnay. The fleur-de-lis (which is French for “lily”) crest is embossed on the label. This Chardonnay is rich but with good acidity and tropical fruit like underripe pineapple and some really appealing citrusy notes. Tom says it has both warm and cool region flavors. Brian says it has richness and freshness. Next they taste a Russian River Pinot Noir that it bottled to support the Russian River food bank. They have done this every year since 2009. It’s a 2017 Pinot Noir that is so young that it’s a shame to open it. Dan says you can taste the potential but you don’t taste what it is going to be. Dan says it’s a real winemaker’s wine because you have to understand the vision of the winemaker. They bottled it right before harvest, only about 2 months ago. Brian Maloney is the winemaker at Buena Vista too, and does a project called JCB for Jean-Charles. Next they taste a wine he calls OFS, which Tom says stands for Our Finest Selection. Dan says it is about 4 to 6 years away from optimum aging. Tom says Brian’s wine is big and complex, that the fruit was picked correctly and not overdone in the winery. In a great vintage he will make 1000 cases. Tom says there are a lot of Pinots that cost more and are not as good as this. Barry Herbst tells about the new Bottle Barn online store, which will have its own flash sales and allows for shipping to almost all the United States. Next they taste the Maboroshi Pinot Noir, made from grapes from the Mabaroshi vineyard. (It’s on the left of the bottles lineup picture, above.) It’s a 2014 and he says it needs at least 10 years to mature. Sonoma Coast, Russian River Valley and Sebastopol Hills are the source areas. Dan says this one will age longer than any of the others from today, up to 25 years. He has worked at this site with De Loach since 2004.